If you want to create great deli sandwiches for your delicatessen menu, you'll need to incorporate all of the important elements, discussed below, that go into making the perfect sandwich. The meat used in any deli sandwich must be fresh and of the highest quality possible. Delicatessen meat is traditionally sliced quite thinly, and is then layered in folds on the sandwich. 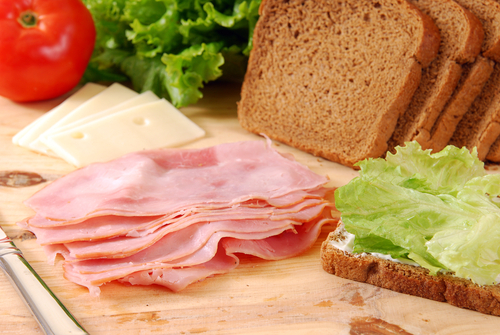 Some deli sandwiches feature meat that is cut more thickly. It all depends on the type of meat being used and the other toppings that will be featured on the sandwich. Regardless of the thickness of the slices, meat should be fresh and flavorful. It is also important to weigh sandwich meat before assembling the sandwich, in order to guarantee consistency and ensure that all your customers will be getting the same amount of meat on their sandwiches. Dressing a sandwich is another important element of creating the perfect sandwich. There are an endless number of toppings and dressings that can be used in making a deli sandwich. Cheese, vegetables, sauces, spices, specialty meats, and even dried fruits can be used to impart wonderful flavors to the meat and the bread in a deli sandwich. While not a necessity, an extra twist or including the unexpected is a great way to make your deli sandwiches stand out from all the other deli sandwiches on the market. Including a uniquely flavored jam rather than a traditional topping, or adding a gourmet ingredient to a traditional sandwich, is a great way to attract the attention of your customers. The method of preparation is another important element of creating a high quality deli sandwich. Sandwiches should be assembled carefully and consistently in order to continually please your customers. Many regular deli customers order the same favorite sandwich over and over again, and these customers expect their sandwich to be exactly the same each time. A specific, careful, and consistent assembly plan using a sandwich prep table, is necessary for all the sandwiches on a deli menu. Another important element of a customer-pleasing deli sandwich, that has nothing to do with any of the ingredients, is the speed in which the sandwich is prepared. When customers go to a deli for lunch or dinner, they often expect to be in and out of the restaurant in a reasonable amount of time. Customers that are forced to wait for more than ten minutes for a cold deli sandwich may become frustrated. It's important to ensure that deli sandwiches can be prepared quickly and efficiently. If a sandwich must be heated, or takes longer to prepare for another reason, it is crucial to inform the customer of this when they order.